What is the Deployment Sequence? 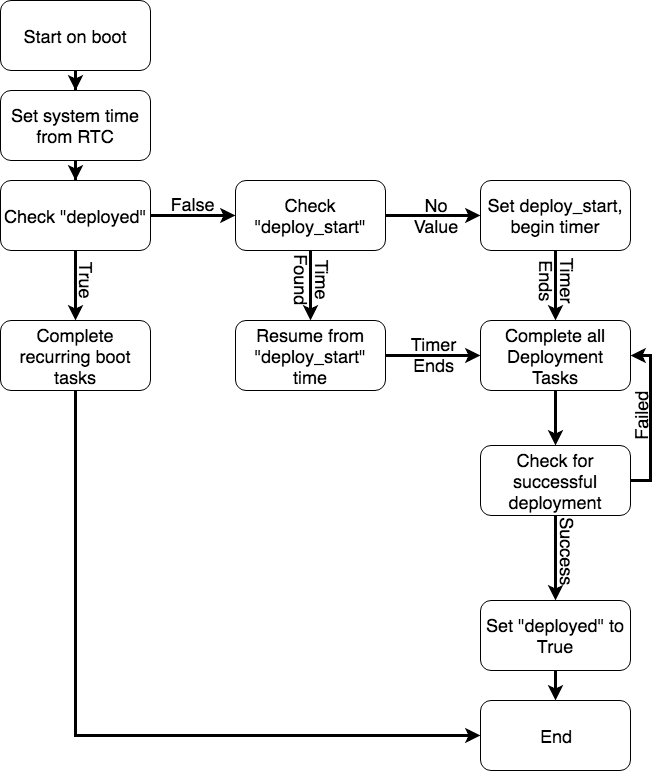 The deployment sequence in KubOS is handled by a mission application. This is a guide for best practices for how to control deployment in the safest and most reliable way within that mission application. All of these tasks often need to occur completely autonomously on deployment from the launch vehicle. Since we are not focusing on a specific hardware configuration, we cannot cover the finer points of items 2-4. Item 1, however, is simply a persistent timer, and we will cover the recommended way to achieve this within the KubOS environment. This implementation requires an accurate realtime clock (RTC) to update the system time. These are currently present on all supported OBCs. The hold time itself should be configured within the application. Notice how deployed is not set to True until all deployment tasks are completed successfully. This is to ensure that these are continually attempted until they are successfully completed so the satellite does not put itself into an unrecoverable state. This is only one possible way to implement the deployment hold time countdown within KubOS. It can be achieved in many other ways, depending on the mission’s needs!